Last week’s ABC nail art challenge was ‘J’. I’d originally intended to do Joker, but when the time came to paint my nails, I wanted something cuter. And what’s cuter than a rabbit with antlers? Especially after I’d recently read an article about how the whole myth may have come about in the first place. I’ll warn you, it’s actually a little disturbing, but still interesting. Read here. To double down on my j’s, I tried to use nail polish with a jelly formula. 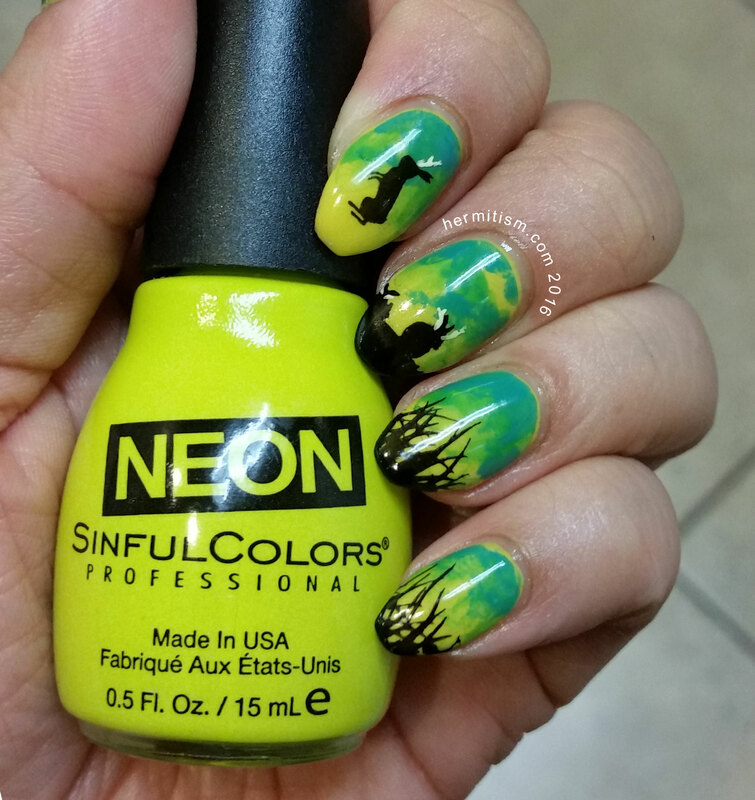 The base colors are Sinful Colors’ “The Bright Thing” from the 2015 Neon collection, Sinful Colors’ “Light It Up” from the 2016 Neon collection, and Zoya’s “Robyn”. The latter two were dabbed on top of the yellow to create a sloppy gradient. Yeah. So lazy I just used my finger to blend things out. 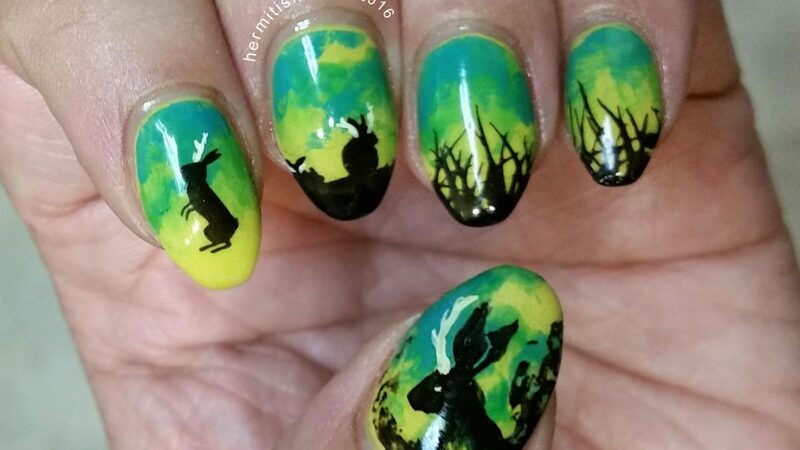 Stamping was done with Wet ‘n’ Wild’s “Black Creme” using Bundle Monster’s BM-706 from the Secret Garden Collection for the grass and a plate I bought on ebay labeled HK-06 for the bunnies. Then I painted on the antlers with white acrylic paint. 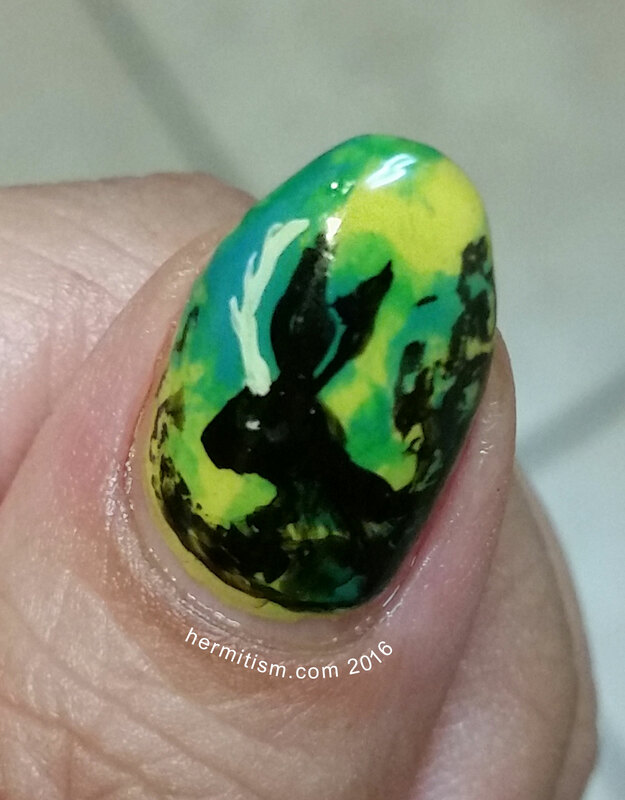 Finally, I completed my thumb with black and acrylic paints since I had no rabbit stamps that would do what I wanted.